Mirrolure 94MR-18 Top Dog 4-9/16"
This 4 3/4", 1/4 oz. green and white Top Dog lure is a top water favorite and features an irresistible "walk the dog" action and fish calling sonic rattle to attract trophy fish. Great for Stripers, Snook, Tarpon, Redfish, Trout and more. Mirrolure 74MR-11 Top Dog Pup 3-1/2"
The most effective surface walkers you can use. Lures are retrieved with a twitching action called “walking-the-dog.” Make as long a cast as possible, then retrieve the lure back to you in a straight line, using short, sharp jerks. This will make the lure dance quickly from side-to-side. Each time you pop your rod tip, you will hear a sonic click coming from your lure. 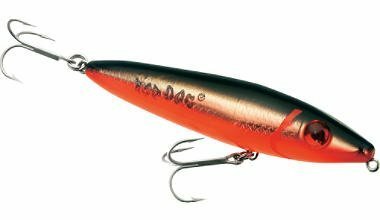 Mirrolure 94MR-CH Top Dog 4-9/16"
These top water favorites feature an irresistible walk the dog action and fish calling sonic rattle to attract trophy fish. Great for Stripers, Snook, Tarpon, Redfish, Trout and more. Available in Red/White, Green/White, Black/White, Blue/White, Black/Orange/Gold and Chartreuse. The most effective surface walkers you can use. Lures are retrieved with a twitching action called “walking-the-dog.” Make as long a cast as possible, then retrieve the lure back to you in a straight line, using short, sharp jerks. This will make the lure dance quickly from side-to-side. Each time you pop your rod tip, you will hear a sonic click coming from your lure. This fish calling rattle inside the echo chamber of the Dogs produces explosive strikes. The Mirrolure S84MR-808 4-Inch Series III Top Dog Jr. Surface Walker is ideal for probing or locating fish on open flats. Sonic "fish calling" rattles can be detected from great distances. Low frequency sonic rattles and life-like action triggers explosive strikes. This surface walker features new holographic foil and (14) fish attracting colors that make the Series III a must have for every serious topwater angler. The MirrOlure 84MR-808 Top Dog Jr is the most effective surface walker you can use. Lures are retrieved with a twitching action called “walking-the-dog. When worked properly, this bait is deadly on Trout, Redfish, Snook and Stripers. The Mirrolure 74MR-808 Top Dog Pup measures 3-1/2-Inch and weighs 5/8-ounces. Provides high quality lures to fishing enthusiasts from all ends of the Earth. 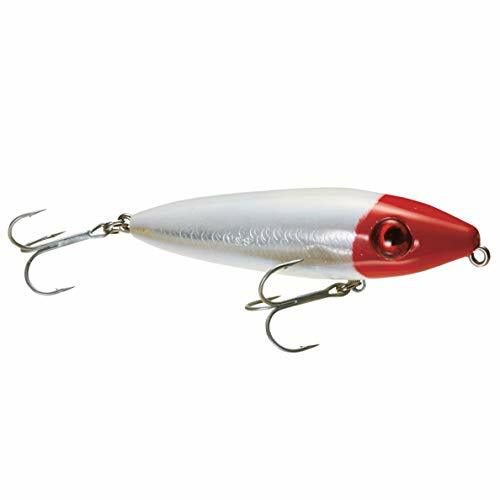 Mirrolure 94MR-21 Top Dog 4-9/16"
MirrOLure 74MR-CH Top Dog Pup 3-1/2"
The Mirrolure 74MR-21 Top Dog Pup measures 3-1/2-Inch and weighs 5/8-ounces. Provides high quality lures to fishing enthusiasts from all ends of the Earth. MirrOLure 84MR-CHBL Top Dog Jr 4"
Mirrolure 84MR-HP Top Dog Jr 4"